The clients can avail from us high quality Fresh Ginger & Ginger Planting Material that is also known as "carrier" herb as well as "synergistic herb". The Fresh Ginger that we provide to the esteemed customers is highly acclaimed for its anti-inflammatory nature and is ideal for curing nausea, motion sickness, colds, etc. We have succeeded in marking our presence among the pre-dominant Fresh Ginger Suppliers majorly cultivated by our farmers. We also provide growth agents that are highly acclaimed by the customers. 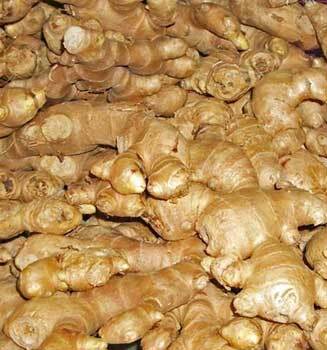 Farmers/Growers must use High yielding & disease resistant varieties so that they get the maximum yield & chances are there that their crop will have disease resistant capacity which is very important in Ginger. We provide High Yielding varieties like – Suprabha, Surbhi, Suruchi, Varda, Maran & some more as per the availability. Method of planting Rhizome bits that are 15 g in weight are planted at a distance of 20 x 20 cm to 25 x 25 cm along with a depth of 4-5 cm. The seed rate of 1500 kg/ha is adopted by following the above process and making one healthy bud to face upwards. Burn all the stubbles, weeds, etc.